The 6-person houses at Resort Poort van Amsterdam are all located on the water and there are three different types. There is type Munt (mh48467). This detached house contains a bedroom and a bathroom on the ground floor. On the first floor, there are two more bedrooms, a bathroom, and a separate toilet. 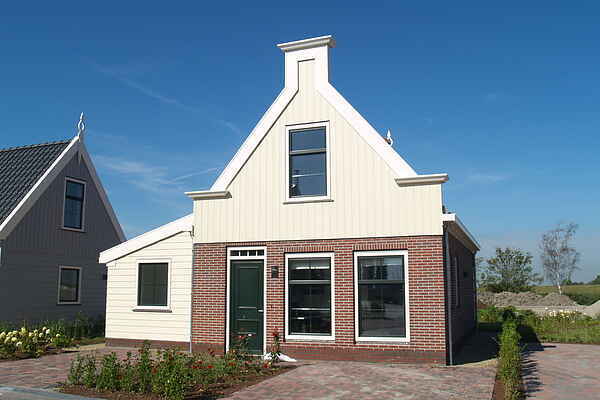 The detached holiday home Florijn (mh48468) is more spacious than the Munt. It contains a bedroom with en-suite bathroom on the ground floor. On the first floor, you will find two more bedrooms and a second bathroom with toilet. Finally, there is the attached Munt type (mh48477, mh48478). This is a semi-detached variant of the Munt described above. In the living room there is a soundproof connecting door, by which two houses of this type can be linked. With that, a detached, 12-person holiday home (mh48472, mh48480, and mh48481) is made. All houses are furnished in a modern and comfortable manner. They contain a luxury kitchen with microwave and dishwasher. There is a fine garden with terrace and garden furniture, and each house has a parking space for one car. The layout can vary. So it is possible that bathrooms are attached to the bedrooms (en suite) or in the central hall/landing. At Resort Poort van Amsterdam, there are also 8 and 12-person holiday homes for rent. Would you rather book an apartment? This is also possible; there are apartments for 4, 8, 10, and 12 people.